February is the month of love. With Valentine’s Day fast approaching, we thought it would be interesting to take a look at one little known insect in the southwestern United States: the lovebug. This march fly is a nuisance to those living along the Gulf Coast and the southeastern region of the United States. For those of us in the southwest, these insects are less of a bother. Continue reading to find out where these fascinating insects got their reputation for love. The lovebug, or Plecia nearctica, is a march fly commonly seen in Florida and other states along or near the Gulf Coast. You may be wondering about their nickname. 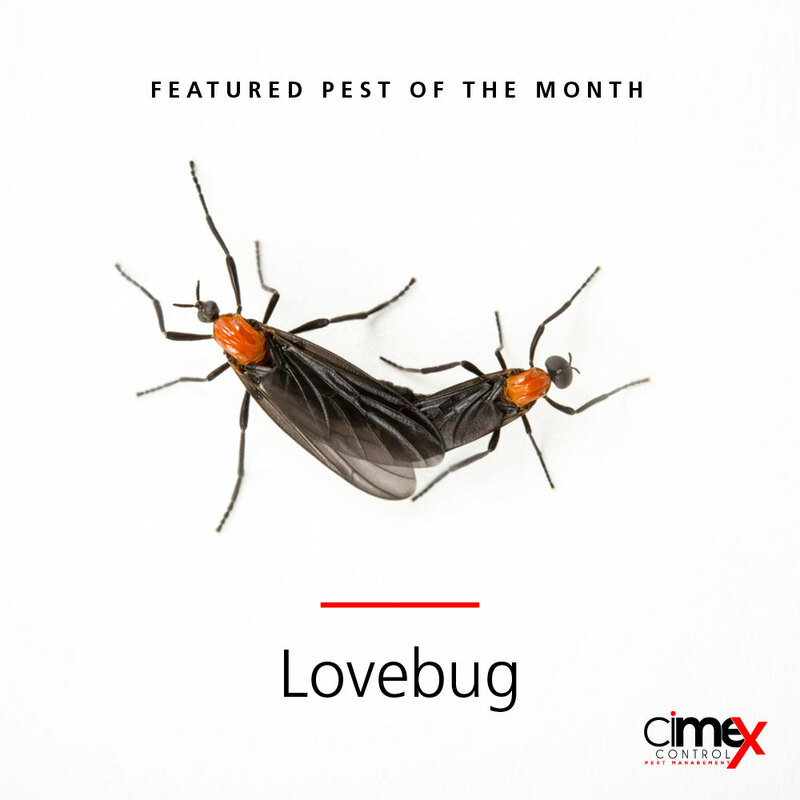 The name lovebug is thought to come from their fascinating mating habits. Lovebugs can often be seen flying around in pairs. This is actually part of their mating process. The process takes hours and takes place primarily in summer. During their romantic rendezvous, the male attaches to the female and stays connected during flight. The process can take up to 12 hours. Female lovebugs die less than four days after they laying between 100 and 350 eggs. Lovebugs don’t bite or sting, but they can be destructive to your car. After driving through a swarm of lovebugs, their acidic remains can damage car paint and clog car radiators if left there. A healthy coat of wax can protect your vehicle, but those living in the southwest U.S. will probably never encounter enough lovebugs to cause serious damage. While lovebugs may not be bothering you anytime soon, our pest control services can help you tackle other infestations. Contact CimeX Control for a free inspection. We build relationships with our clients so they feel free to communicate with us about their unique challenges. We also tailor our plans to each pest problem, making sure we remove critters the first time. Call us at (602) 688-4985 or send us a message at ftorres@cimexcontrol.com.